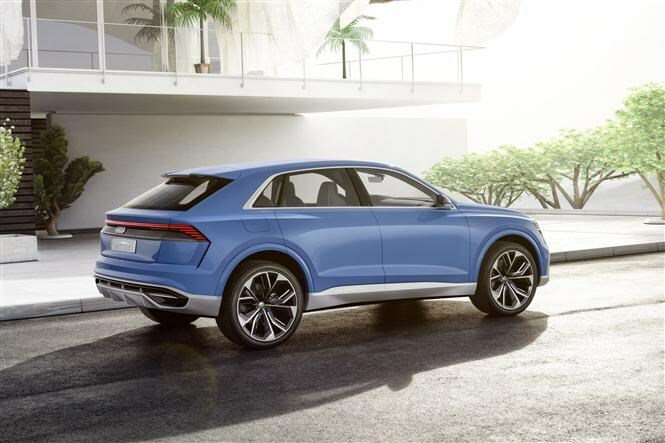 What you see here is the Audi Q8 concept car; the firm’s flagship hybrid SUV unveiled at the 2017 Detroit motor show. While this is unlikely to be identical to the production model arriving in 2018, it does provide a close representation of what customers can buy when the Q8 arrives in showrooms. Will the Q8 be even bigger than the Q7? 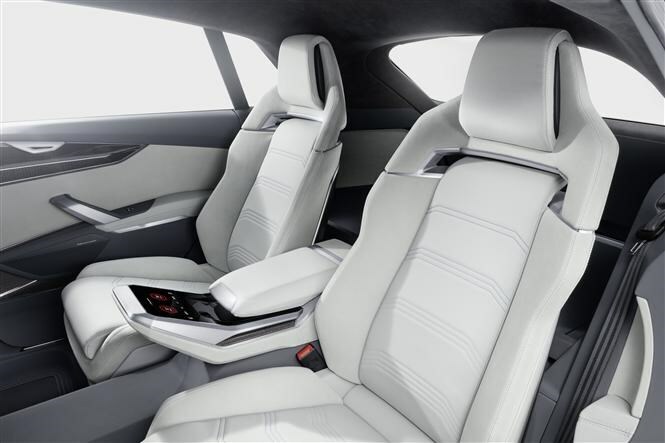 Showcasing a luxurious, four-seat SUV in concept form with a focus on comfort and space, the Q8 could perhaps appeal to those who prefer to travel in business class aviation, thanks to its individual seats and control settings. 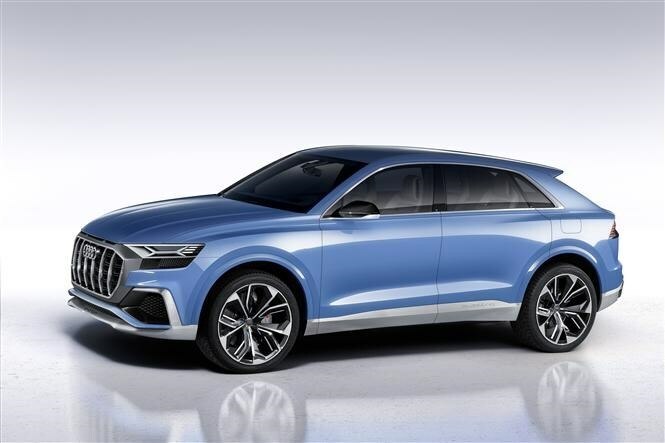 However whether the production model will be a strict four-seater remains to be seen; this will be the stylish alternative to the more practical Q7 – just as the BMW X6 and Mercedes-Benz GLE Coupe provide an alternative offering to the X5 and GLE SUV respectively. At just over five metres long, the Q8 is shy of the seven-seat Q7 in terms of length, but it is wider, at over two metres. With a wheelbase measuring at three metres, there should be plenty of space inside for passengers and their luggage. To put this into perspective; a Smart Fortwo comes in at under 2.7 metres in length. A low coupe-styled roof means the Q8 avoids both the squared-off profile of the more practical Q7 and also any height restrictors you may encounter, thanks to its 1.7-metre height, making it lower than a Land Rover Discovery Sport. This could compromise on rear headroom for passengers but hopefully the seats will recline and slide to cater for all shapes and sizes. 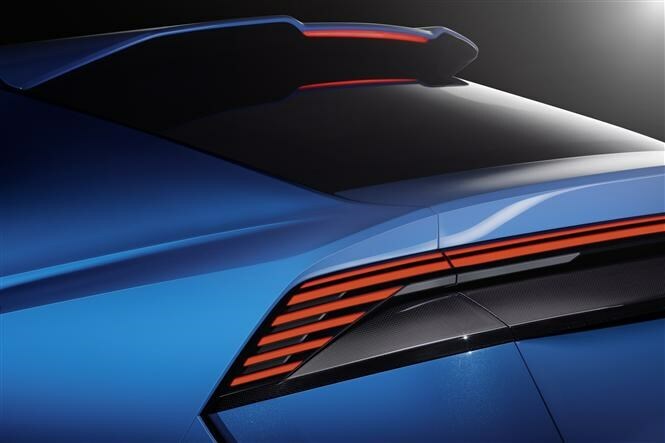 Styling cues include doors without window frames and Quattro logos integrated onto the rear passenger doors, while full-width tail lights stretch across the rear to form part of the e-tron signature. 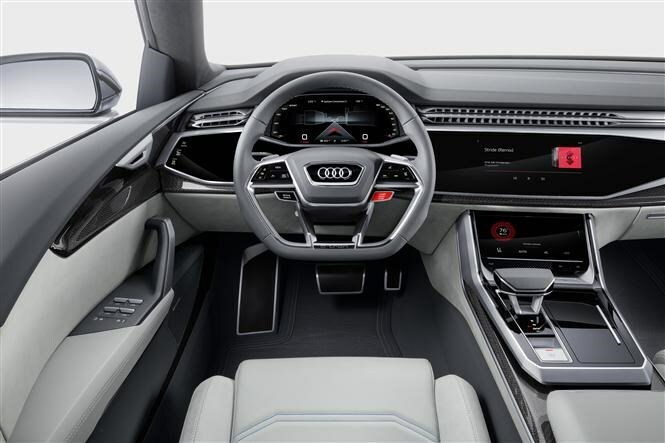 Inside the cabin, gadgets include an enlarged version of Audi's Virtual Cockpit instrument panel and next-generation head-up display for the driver, with a noticeable lack of buttons elsewhere due to the heavy use of touchscreens for the passenger controls. 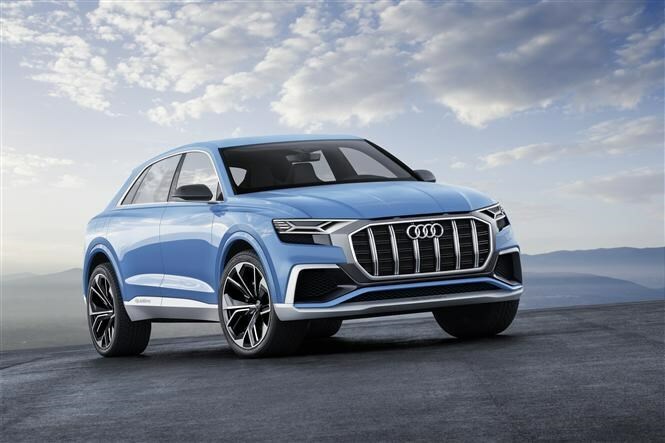 Unveiled as a plug-in hybrid, the Q8 will be powered by both an electric motor (generating 134hp and 330Nm of torque), and a conventional 3.0-litre turbocharged V6 petrol engine producing 333hp and 500Nm. 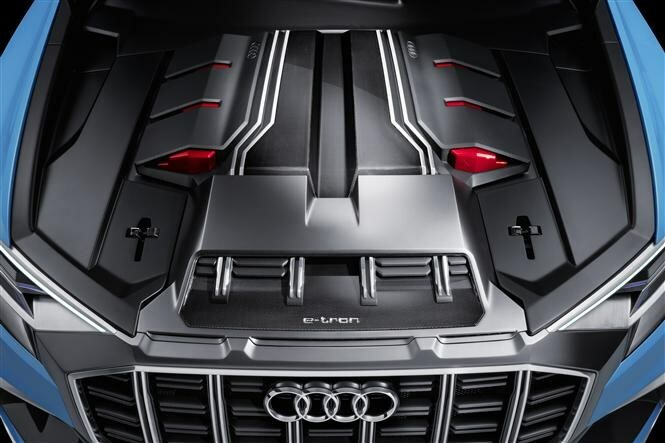 Maximum output is rated at 449hp and 700Nm, which is enough to get the Q8 from 0-62mph in 5.4 seconds, before heading onto a 155mph top speed. An electric-only range is projected at 37 miles with a total range of 621 miles when running on both petrol and electricity. A full battery charge can be completed within two and a half hours depending on the power source output, with a maximum claimed 122mpg in hybrid mode. With a CO2 output of 53g/km, the Q8 will cost £25 in road tax for the first year and £140 for every subsequent year based on the 2017/18 taxation rules. For company car drivers, this will equate to a BIK tax band of 13%. 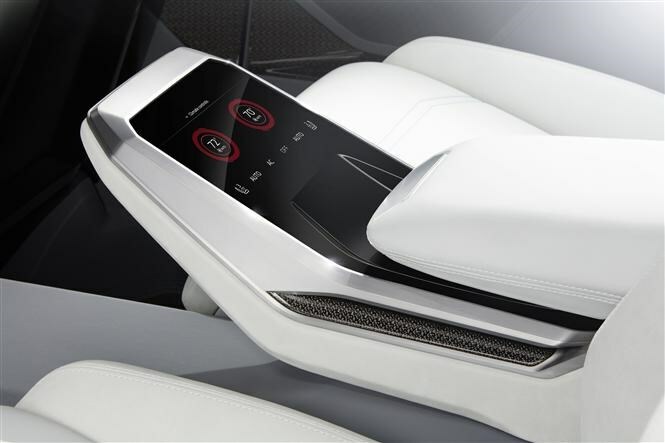 Three drive modes will be available to choose from, with drivers able to switch between EV mode for electric-only propulsion and Hybrid for a mixture of electric and engine power. Battery hold mode preserves the current battery level to be used at a later point in the journey. 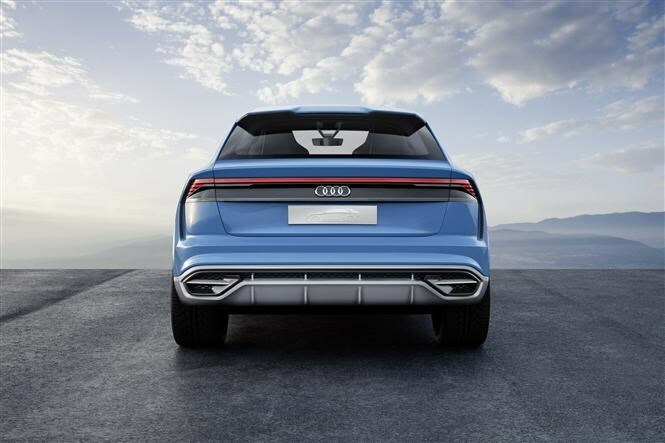 The familiar Quattro all-wheel drive system will be fitted with a system to deliver torque to the wheel with the most grip to maximise efficiency and stability. Adaptive suspension will also be fitted to allow for a range of comfort levels - handy if the 23-inch wheels fitted to the concept make it into production, but also allow the ground clearance to be raised by 90mm for off-roading.